I’ve been busily making summer tops and lace. This has been great commuter and movie-watching knitting, believe it or not. Let’s start with the Lillian Top. I LOVE this pattern. I cannot say enough about it. It’s a fast and easy knit. Took me all of 9 days and I only knit it at night when I could put in a hour or two. As always, clic on the thumbnail to see a larger pic (unfortunately, for some reason this template distorts in IE when I put in large pictures instead of thumbnails. Sorry! BTW, my blog is best viewed in Mozilla Firefox). Notes: I would not do 5 lace repeats for the body. I find this to be too long. If I make it again, I would only do a total of 4 repeats of the lace pattern. Also, I would start the armhole section sooner as I have large arms. A couple of days ago, I emailed Anne Hanson from KnitSpot and asked her advice on something I wanted to make. 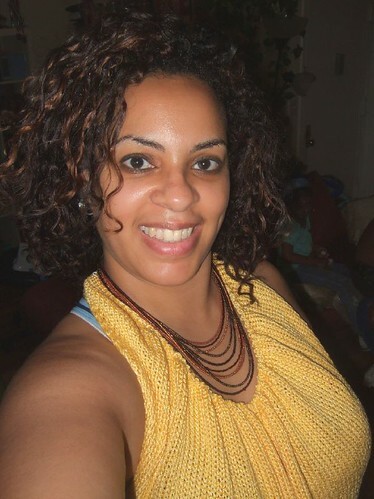 I was thinking of a nice large shawl to use almost like a sarong over my bathing suit this summer. She recommended a couple of her patterns but she mentioned she had a cute little lace skirt PERFECT as a cover-up, Sangria. Of course, once I saw her pattern, I jumped and bought it. I cast on last night using Knit Picks Shine Worsted in Terra Cotta. So far so good. No pix yet because I’m not that far along. I am sending out soap orders hopefully by Friday. I haven’t had a chance to run to the post office with the training at work so they’re a tad delayed but I’ll add a treat as “thanks” for your patience!! A few weeks ago, I finished Wicked. This pattern was an absolute breeze to knit being mostly stockinette in the round. It’s my first top-down knit and I LOVED it! 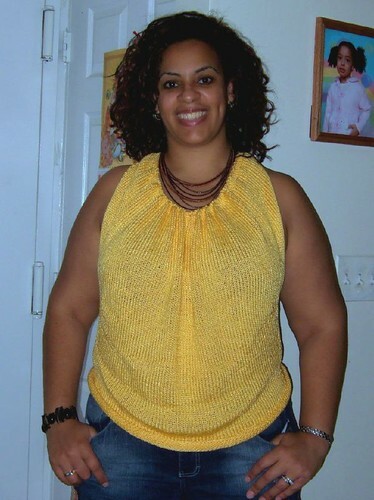 I will definitely knit more tops this way and more tops from this designer, too. This counts as yet another project for the Knit From Your Stash 2007 KALas I used Karabella Majestic from my stash. I used all of 8 balls. This yarn is super soft and feels so nice against the skin. Even though it has mohair, it’s not scratchy at all.